Here we go again. A new head coach, the #1 jersey, and the tired conversation about Braylon Edwards. A new head coach, the #1 jersey, and the tired conversation about Braylon Edwards. For a program that's getting back on it's feet, Edwards' stewardship over the legacy of the #1 jersey is becoming more and more of a useless distraction that has spanned 10 years and 4 head coaches. And now, Edwards' is trying to use his leverage to work his way back into the Michigan program. Anthony Carter started the lore of the #1 jersey back in the late 70's. Greg McMurtry continued it in the mid 80's. Derrick Alexander resurrected it in the early 90's. Tyrone Butterfield disgraced it in the mid 90's. David Terrell was handed it in the late 90's. And Braylon Edwards earned it and then put it on his own pedestal in the mid-2000's. When Edwards began his scholarship endowment for any receiver wearing the #1 jersey in 2006, it elevated the number to a status even the half-baked legends jerseys never achieved. It went from being a number that stood for excellence...but in a quiet dignified sort of way, to being a side show with Edwards as the ring leader wielding all of the authority. For prospects now in high school, all they really know about the #1 jersey at Michigan is conflict, debate and bitterness. There are stories of great players wearing the jersey, but most of it occurred generations ago. When Devin Funchess came out for warm-ups against Appalachian State in the 2014 opener with the single digit on his jersey...the immediate reaction was "What will Braylon have to say about this?" He was actually in support of Hoke's decision. But after a pretty lack-luster junior season, after which Devin bolted for the NFL, any debate about Funchess' worthiness quickly died out...as in, he wasn't. A recent locker room video indicating that incoming freshman Dylan Crawford (and two non-receivers) would be wearing the #1 jersey has reignited the tired, worn out debate over whether that player is worthy, and/or whether the current head coach has the divine blessing of Edwards. Edwards knows about the Crawford locker room video. This appears to be a sharp departure from the Braylon of old. Rich Rod had no wiggle room for the numero uno, and after he butted heads with Edwards after temporarily giving it to freshman defensive back JT Floyd in 2008, Rodriguez shelved the number never to speak of it again. Brady Hoke had a little more leeway, but other than Funchess' one season with it, it was never really an issue mainly due to the legend jerseys experiment. But now it seems Jim Harbaugh, whom Edwards played for in SF in 2011, gets a pass. Remember, it was initially stated that a freshman could not wear the #1 jersey. A lengthy Daily article from 2011 with multiple quotes from Stan, Braylon's father, spelled it out. Stan sets the story straight real quick. When Braylon established the $500,000 scholarship fund for receivers to carry on the No. 1 tradition, it was the school that brought it to him in writing: you will be consulted on who gets to wear the jersey. According to the Detroit Free Press, Carr and Braylon had set up requirements for the jersey: no freshmen, a suitable GPA and appropriate off-the-field conduct. So why the sudden reversal on this stipulation? Simple. Braylon wants back in. Now living in the area again, Edwards said he wants to be more involved with Michigan football. He said playing in the NFL and the lean Michigan seasons before Harbaugh arrived kept him disengaged with the program. “Between going from team to team, I wasn’t in this area and then we had a couple eras it wasn’t fun to watch, so I stayed away,” Edwards said. “Now that I’m back, now that I know what it means to be a Michigan alum and to see that winged helmet and be involved, I definitely want to be involved with some facets. So now that Michigan is fun to watch again, Braylon rather conveniently, wants to be more involved. 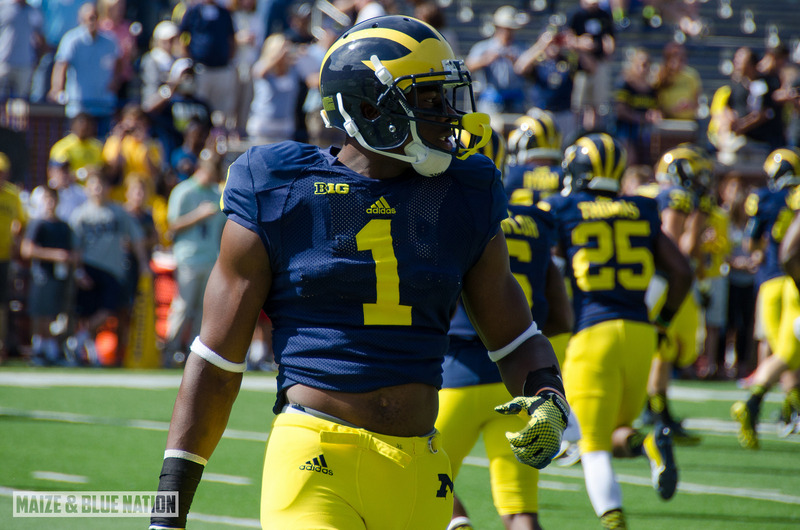 I will never discount what Braylon did as a player during his time at Michigan...he was phenomenal. But ever since he began this scholarship endowment and his bitterness towards Michigan for not recruiting his younger brother, Braylon Edwards has been little more than a constant distraction for the program. He wants to teach current players what it means to be a Michigan alum? In this blogger's opinion, look no further than #21.